For quite a while now, I have had an urge to attempt a childrens book but with some historical content…something that wil both entertain and teach. So, after months of tapping away at on my laptop, and with the help of my grandaughter, who is a budding artist at the age of just 11, I have finally finished. I hope you will enjoy it and any comments would be welcome. 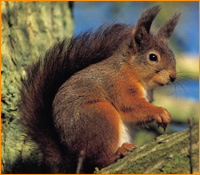 In The new Forest there were many squirrels who were talking to John, telling him that there were many old trees which they thought should be cut down and the stumps left in the ground to decay in order to add richness to the soil .The king had forbidden this. John was about to ask the squirrels why, when suddenly they scampered off and all the birds and other animals scurried off with excitement. It seems there was much unrest among the people living around the New Forest and quite suddenly many of these people from nearby hamlets came running out of their homes shouting with excitement pushing and shoving each other. John was jostled along with them. “ The King is coming” they shouted while John enquired “ who the men were riding with.” “ Those are the forest officials” one of the squirrels whispered. Everyone bowed to King Richard as he stepped down from his magnificent horse. There was complete silence, even all the animals were quiet waiting for the King to speak. The squirrels were saying they have come to lay down some new laws for the villagers to abide by. But only John could hear the squirrels remark. King Richard continued saying , “ No one is allowed to hunt the large game such as deer or wild boar not even smaller game birds like the pheasants, partridge or grouse . “ But your majesty we cannot even enclose the ground we do have to keep the deer from straying from the forest and destroying what little food we do have,” the poor peasants were saying. “That’s done it! 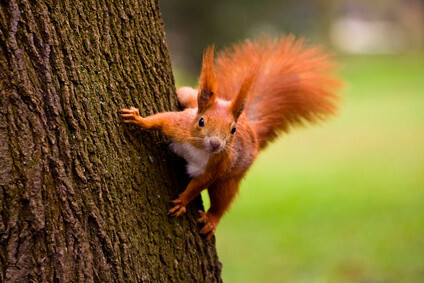 we won’t be able to bat an eyelid now with those men watching our every move,” Squirrel Topsy said to John. 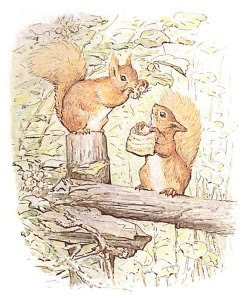 “ Oh thank goodness you have got names, I was beginning to get fed up just calling you squirrel, and what are your friends names?”“ Oh well there’s Flossie, Millie, Daisy, Dosey, Cheeky ,Lazy and Nutty.” replied Topsy. “Well, we could get some of the lovely village wenches to bribe and entice them with a few drinks of our tasty meads,” said Cheeky with a giggle. “ Maybe we can bribe them first with the promise of some extra game bird’s to cook, which will keep them and their family’s well fed for a few days, or even weeks,” John answered . 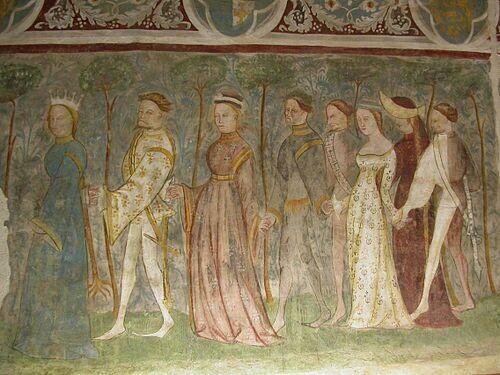 Meanwhile when John arrived at the castle he was led to the banqueting hall and presented before King Richard. The King explained that the occasion was that of the long awaited visit of King Louis of France, whereby there was to be an elaborate banquet. 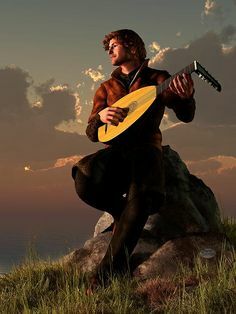 Minstrel John was to play his very best music for everyone to dance and make merry. But first we will begin with the feasting. Once King Richard and his guests were seated at the banqueting table in the great hall there came a loud fanfare of trumpets as the servants brought out the most exotic food that John had ever seen. There were cooked dishes such as swans and geese so lavishly decorated laid at the top table for the Kings guests. One of the servants was dishing up a roast peacock complete with its head and tail feathers as one of the main dishes. There was crane, heron , gull , quail, blackbird and thrush amongst other varieties of birds being served. There must have been more than twenty dishes of different choices. John couldn’t believe his eyes when he saw a huge wild boar which was brought in on a large platter and placed before the guests. There was venison and pasties along with many more mouth watering foods to please the guests. In the center of the table were coloured jellies shaped to look like a pheasant, peacock or swan, even rabbits. There were various sweet dishes one being custard tart, and there was plenty of fruit and nuts with a variety of ales, meads and wines to follow. Whilst looking at all this lavish food John couldn’t help thinking about all his village friends and their families who were starving, in fact, he was feeling very hungry himself and wondered if there was any way he could get one of the cooks to smuggle some of the food from the royal kitchen for him to take back to his village as he had promised the villagers he would. 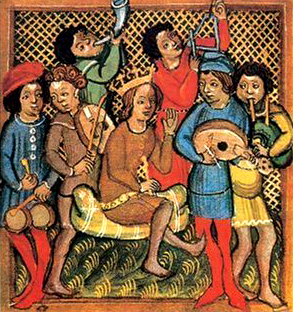 Just then minstrel John was called to entertain the King and his guests, he was invited to join other musicians in the gallery and the merriment began. silk dresses of blues, greens, yellows, purple and gold and the men looking equally as handsome in their bright coloured coats and wigs upon their heads. “ Oh it’s alright for some isn’t it, we have to wear nasty looking woollen garments making us look so dowdy and drab, no wonder we always feel so miserable” the cooks from the village said. Never mind we will have our own little banquet tomorrow , and Minstrel John will provide the music for us to dance to. “We are all looking forward to that” the villagers were saying, and after that we must concentrate on luring the foresters away while we do some poaching because John may not be able to bring us some food from the Kings banquet.. Everyone began walking back to their small village homes while talking between themselves about the party and what they were going to wear ,as they wanted to be able to dress up in something special, but dress up in what, they had no idea. The squirrels were also chattering to each other and Topsy thought it would be a nice idea if the villagers were able to dress up for their little banquet. “ Well let’s talk to John and suggest a few idea’s for him to give them”. So early the next morning when John returned from the Castle the squirrels gathered excitedly around and told him their idea’s which he agreed with, except as he said, “ what do the villagers have to dress up in other than that they wear every day” “Well now let’s think” they said. “ I have an idea” Daisy shouted while flashing her lovely bushy tail. “ Oh stop showing off” said Millie. Daisy continued saying “ what if both the men and the women dyed the top part of their outfits ,each a different bright colour and others dyed the bottom part of their outfits then each villager can pair up with a different colour that will make it seem brighter and much more cheerful. “Yes! that sounds a great idea except they won’t have time for all that if we are having our party tonight” “ Oh well we will have to change it to tomorrow then instead so that we do have more time” Daisy replied. “ Just then Lazy woke up shook himself rubbed his eyes and asked “what was going on.” Once he was told Lazy thought of another idea for their hats. He said that “the women could put ribbons around their straw hats and also adorn them with something else like daisies or other flowers.” “Well I think that will be enough for now” , said Daisy. When John explained to everyone that their banquet was to take place the next day they all grumbled until he said they were to dress up. “ Oh yes and what with? We have no posh clothes they said.” “Well what about making them look posh then, Once John had given the villagers some of the idea’s they all agreed that they would need the extra time and scattered off once again with excitement. John and the squirrels were anxious to see what their outfits would look like. Later on in the day as everyone slowly emerged from their homes John was delighted to see how hard everyone had been working on their appearances ready for their very own banquet. “Ooh don’t they look stunning” said squirrel Millie “ I can hardly recognize them” remarked Topsy. Some of the squirrels including Flossie , Millie and Daisy had found a few small branches covered with leaves and berries and had intertwined them around their bushy tails other squirrels had put bows around their tails, and around their necks were hanging some tiny daisy flowers while Dosey, Topsy, Cheeky and Nutty each had a huge leaf placed upon their heads made to look like Robin Hood hats, and a string of acorns around their necks, they also had put some tassels of aromatic plants around their tails. Flossie just burst out laughing saying “What have you put those silly tassels on your tails for you look more like lady squirrels now.” “ We don’t care” Nutty replied “ besides we have our Robin Hood hats and only men squirrels wear those”. Flossie just made a grunting noise and scampered off with the rest of the squirrels to see if everything was going to plan. Everything was ready to begin with the merry making. All the villagers were now gathered together waiting for John, who first addressed them saying, ”My friends, we may not be Barons and Earls and we may not have silks and satins with which to dress up in for our banquet but you have certainly done your very best to look shall we say, Posh! So now let us begin with the merriment” and with that he began to play a lively tune on his flute, everyone cheered and began dancing. They looked so happy in their brightly coloured clothes and forgetting their troubles for a while at least. They twirled each other around and around they clapped their hands and sometimes danced in circles, some of them were imitating the Lords by trying to talk very posh just for the fun of it. 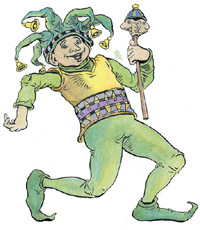 One of them had appeared dressed as a court jester saying “I can do the same as a court jester at the Kings banquet” he said, but of course he couldn’t because he dropped everything, this made everyone jeer at him. “Well!” said John” I think everything is ready, so shall we begin with the feasting, and we will have it served as if we were in the Kings banqueting hall shall we?”. Everyone cheered in agreement as John clapped his hands together and ordered the villagers who had prepared the meal to bring forth the food. And while the pheasants and chickens were being carried in on a spit to the tables John played merry music on his flute. 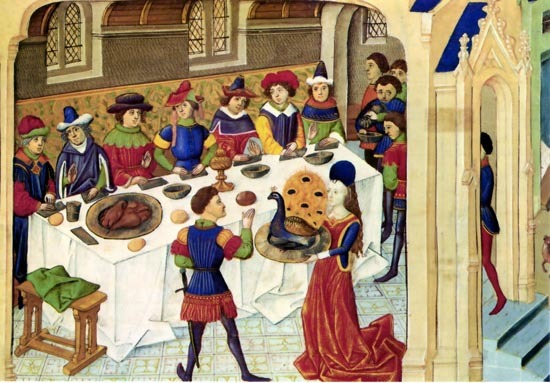 The cooks had gone to a lot of trouble dressing up the pheasants to look like peacocks with beautiful coloured tail feathers, looking as they would at the Kings banquet. The chickens were also dressed up looking very fancy indeed. A villager had supplied one of his pigs and put a ribbon around its neck and stuffed an apple in its mouth for the occasion. The sweet dishes consisted of comfits made with honey and fruit. 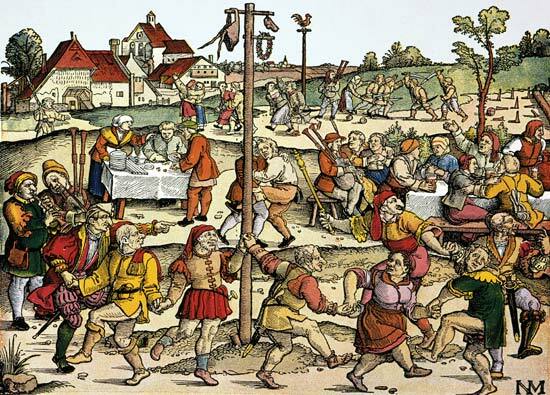 There were broths, soups and pottages seasoned with spices, also many vegetables and plenty of fruit and nuts with a good supply of mead and ales with which to swill down the food, this of course was making everyone merrier while dancing eating and drinking. Photo courtesy of The Grainger Collection. The squirrels now decided to appear with Daisy saying “ come on lets show them what we can do” as she glided from tree to tree followed by the rest of the squirrels chattering between themselves. The villagers and John were amazed to see how they had made themselves look, especially John, because not one of them had told him what they were going to do and the villagers could not understand how the squirrels knew about the banquet . “ I haven’t a clue” said John “ but I guess they are more intelligent than we realize”. The squirrels then began a little dance of their own by swaying their hips to the music then turning and swinging their lovely bushy tails round and round. Dosy and Cheeky were so impressed that they took off their leafy Robin Hood hats and with a slight bow led them to dance and the rest of the squirrels followed. They danced and twirled around with each other along the thick branches of the trees to the lively music being played not only by John, but other minstrels who had come from other hamlets, so there were other flute players and harpists, and as the villagers danced the squirrels came down from the trees and began their usual antics of gambolling, skipping and jumping over each other while trying to dance as well. They chirped and chattered as if trying to sing with the villagers who were absolutely amazed by the squirrels taking part in their very own banquet. When John woke the next morning he was amazed to see that everything had been cleared away including the tables and benches .In fact, no one would have known that there had been such a party taking place there except for the smell of the food and drink, and that the squirrels were all hanging from the trees so quiet and not moving. It seems they had indulged in the wines and meads so John left them to sleep it off. The following day John and the villagers gathered together to discuss the plan of action of how to distract the foresters attention while they searched for a deer or a wild boar they could poach. Almost everything had been eaten at the villager’s banquet and they needed desperately to replenish their stock. They only had a few rabbits and chickens and one or two pigs to cook so they wouldn’t last long. “I think the only way to do this is to encourage the forester’s to drink enough of our strongest mead so that they don’t remember where they are and don’t notice us men sneaking away. Also get them dancing with the womenfolk who would make lots of noise.” Said John. Everyone agreed it was an excellent idea and scurried back to their homes to begin making more of their mead. Of course the farmers had forgotten all this while they were happily making merry at their party and they couldn’t think of any excuse for their neglect. One of the foresters was shouting and beating some of the villagers. “ You lazy good for nothing people you will be severely punished for your laziness.” “Oh please good sir don’t beat my husband like that he is very ill with a disease which might be catching.” With that the forester let go very quickly thinking he might catch the disease. One of the wives rushed to fetch a sample for them to try .Of course the foresters spat it out saying it tasted disgusting, “ but you can bring some more in case we are thirsty” they said .So off the farmers went to their work hoping the foresters would be tempted to drink lots more of the mead, which they did, and once the farmers wives were sure the foresters were merry they began to encourage them to dance by playing one of minstrel Johns flutes while singing and clapping their hands and generally making as much noise as possible. Meanwhile the peasants in the forest had managed to talk some of the prettiest wenches into enticing the forest officials away from their village. One of the girls was extremely pretty with long black shiny hair and had lovely big blue eyes a beautiful face and she had such an infectious laugh. 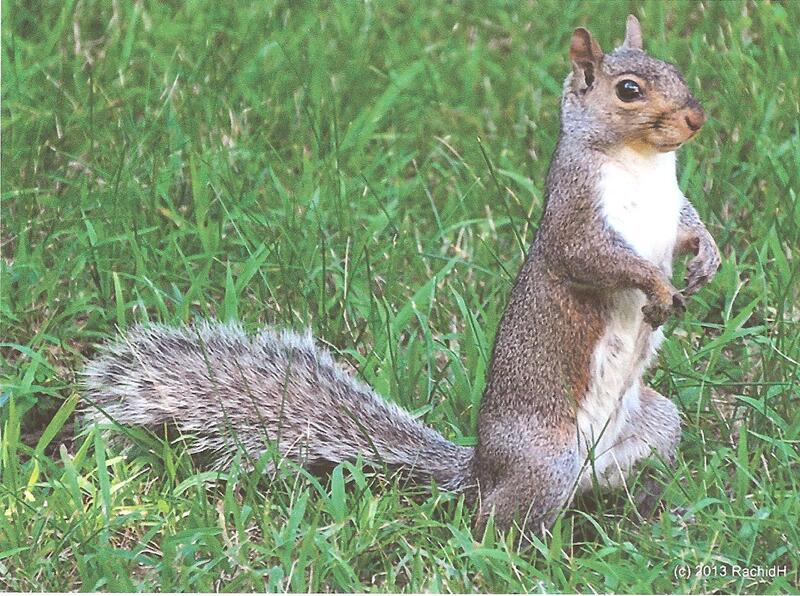 The squirrels also had their mischievous idea’s ready for when they next saw John they all scampered to greet him chattering and skipping around anxious to see what he was carrying in the bag on his shoulders. “What have you got there John” one of the villagers asked, “Oh you will have to wait and see” he said so they all followed him to his home including the squirrels, “ stop pushing and shoving” Millie squirrel was saying to squirrel Flossie, and as John placed the bag onto his kitchen table he pulled out some chickens, a couple of rabbits and some pheasants. “ Where did you get those from?” the villagers asked while laughing and saying “ well you are the right little Robin Hood” aren’t you “ Well you just be thankful I have managed to get this food for us” John said “ and don’t ask any questions. but we must be very careful someone will have to keep a lookout so that we don’t get caught, especially while cooking this lovely venison I have here in this other bag. “That’s the Kings meat and if we are discovered cooking it we will have our hands cut off”. Everyone looked up in horror but they were too hungry to worry. “I will go and hide it all until tomorrow then” one of the women said “ when I come back we want to hear all about the Kings feast.” “ Oh blimey we’ll be here forever” said Cheeky. Minstrel John began saying, “Well the food which I brought home in my bag is nothing compared to the delicious dishes served at the table covered with silk cloths and adorned with silver and gold candlesticks. But before the meal the guests washed their hands in a silver basin brought to them by the attendants. “Oh very posh” remarked one of the peasants. “Then beginning with a fanfare of trumpets the musicians began playing their merry music, while the food was being carried into the hall yes! yes! get on with it John” everyone was getting impatient to hear more including the squirrels who were clambering up and down the trees doing summersaults and chirping to each other in their excitement. John continued, “ the table was laden with roasted meats such as mutton, venison pork, geese, fowls, ducks, hare and rabbit which had all been dressed” “ What do you mean John had they got hats and coats on” the villagers asked laughingly. “Well for instance” John replied “there was a roast peacock complete with it’s head and tail feathers sitting on a platter looking like it was still alive. There was crane, heron and gull, Oh and coloured jellies and many sweet dishes also vegetables and fruit and plenty of meads, ales and wines to drink from silver goblets.” “ Ooh we would have loved some of that” the peasants chanted. The squirrels wanted to know more” go on, go on, there must be more” they whispered to John. “Oh yes there is much more. I would say the thing I particularly noticed was that some of the guests were so greedy cramming so much food into their mouths all at once, that you would think they hadn’t eaten for months some of them looked like stuffed pigs themselves.” “ They should try living as we do for a while they would soon learn what feeling really hungry is like” shouted one of the farmers. 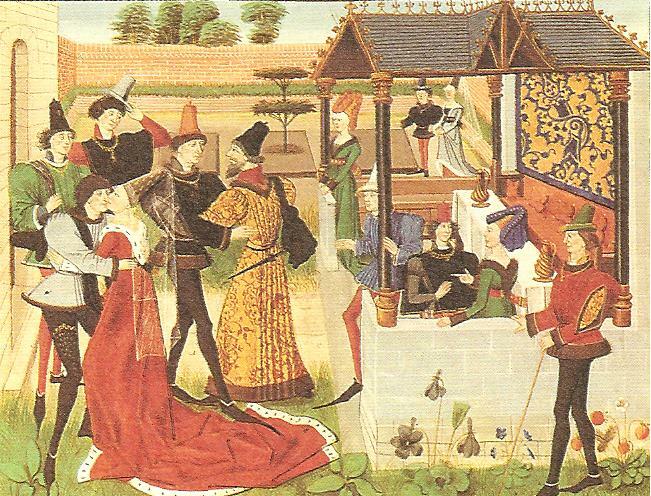 Apart from all the lavish food John continued there were jugglers and tumblers entertaining the King and his guests. The tumblers were gambolling one by one over each other while making comic faces and tight rope walking, and generally showing off their trained animals like the monkeys to do various tricks. The squirrels thought this was hilarious and all began gambolling over each other and tightrope walking along the branches of the trees while pulling funny faces like the monkeys, until Daisy missed the branch and fell off. “Now then” said John let me tell you about the jugglers. “ They recited poems and sang love songs, they played all sorts of instruments and did wonderful somersaults, leaped through hoops, and walked on their hands” “Oh that’s nothing” Nutty said “ we can do all that can’t we boys,” while displaying some cartwheels. Soon everyone was laughing at the squirrels antics. “Are you going to tell us about the grand ball” the villagers enquired. So John continued to explain this while trying to remember every detail he could. “ The grand ball he said was magnificent, but it was difficult for me to notice everything while playing my music with the other musicians.” “ You were highly honored then” everyone commented. “Yes I was invited to join them in the special musicians gallery.” John continued to explain that “ when there were enough equal numbers of both men and women the ball began and they took each other by the hand to begin the dance. Well I am afraid that is all I can tell you about the Kings banquet, except that he was very pleased with my music and promised he would see that I was rewarded in some way. But now I would like to know what has been going on whilst I was away?”. “ Well we did manage to get the foresters drunk” the people told him. Unfortunately one of the foresters did not drink the wine and had been keeping a close watch on what was going on he was very suspicious and went to check that the farmers were doing their work, he didn’t trust the women who were flirting with the other foresters and pouring them more and more wine until they were falling all over the place with merriment. Meanwhile the squirrels now decided it was time for them to help and it was Nutty who first offered all the hazel nuts he had been storing saying “ we could bombard the foresters with them,” “ a good idea” answered Millie “we could all gather more nuts so that we have plenty to throw and drive them away.” “I don’t think that will be necessary, most of the foresters are drunk anyway just the odd one or two of them who may not be quite drunk enough and may become suspicious like the one who didn’t drink anything at all ,we have to find some other way to get rid of him.” “I know how we can do that” said Cheeky, “ Oh! and what’s that smarty pants,” Nutty asked. “Well” continued Cheeky, “ we just tell John to climb the nearest tree and drop a huge piece of wood on his head and knock him unconscious,” all the squirrels thought that was funny and rolled around the floor laughing. While the squirrels waited to see John they all scrambled through the forest, and collected as many nuts as they could find and anything else they could carry suitable to throw, and hid them altogether in one spot, then scurried to gather lots of leaves to cover them with until they were needed. 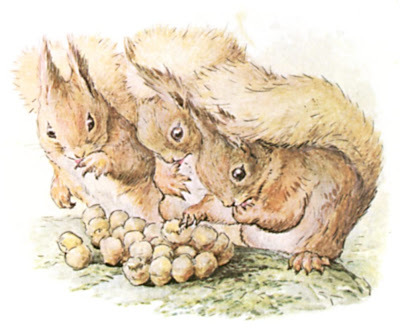 Illustrations Beatrice Potter Squirrel Nutkin Public Domain. Outside the evening was beginning to get dark and the village farmers had finished their work and were arriving back to their homes to find the foresters were all sprawled out around the village asleep. The farmer’s wives had done a grand job of dancing them off their feet and getting them well and truly drunk. The farmers were now ready, so they quietly began creeping away into the forest hoping they would have enough time to carry out their plan before the forester’s awoke. In the meantime the squirrels were keeping an eye on the one who was asleep but not drunk, they thought he was pretending to be asleep and fearing he might wake at the slightest noise. All was quiet for a while except for the foresters who were snoring loudly. Suddenly one of them began shouting and cursing in his sleep which woke them all up, but they soon fell back to sleep again, except for the one who was sober and he proceeded to walk towards the villagers. When the farmers wives saw him they began to panic and quickly decided to make a lot of noise by singing laughing and dancing so as to distract him, but he was not at all impressed and wanting to know where their husbands were. The forester caught hold of one of the women by her hair and dragged her outside from her home threatening that she would be put into stocks if she didn’t say where the men folk were. She began screaming and crying saying that “ she didn’t know”. All the squirrels had heard her cries and had scampered to collect all the nuts they had hidden and quickly scurried to the rescue. Now all the squirrels in the forest were gathered together each carrying as many nuts as they could which they had wrapped in large leaves. All the noise had woken John and as he strolled outside he was alarmed at seeing one of the women being beaten and wanted to know why. He was also surprised to see all but one of the foresters asleep and snoring. The squirrels were hiding nearby in the trees. 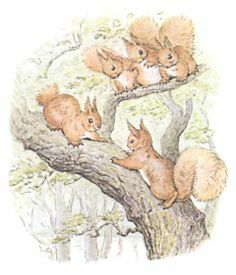 Topsy had got as close to John as possible and whispered for him to “ get the forester as near to the big tree as he could ,so that they could throw the nuts and distract him,” giving John enough time to then knock him on the head with a huge lump of wood which the squirrels had placed at the bottom of the tree. John could see which tree they meant by the large piece of wood at the bottom of it. “Why are all my men drunk?” the forester asked John, and “ some of your farmers are missing from the fields, what’s going on I want to know.” “ Well as we told you before, some of our friends are not well, we believe they have a contagious disease” John answered while moving towards the tree so that the forester would follow him. The squirrels were looking forward to some fun and found it difficult to keep quiet. Meanwhile John was doing his best to keep the forester talking while guiding him towards the tree ,the squirrels began throwing one or two of the nuts which caught the forester sharply on his nose, and as he looked to see where they were coming from the squirrels bombarded him with lots more, which caught him on his head his face and his neck ,there were so many coming at him one after the other that he could not see where he was going, which gave John the chance to strike him over the head with the piece of wood and knock him out. Flossie, Millie and Millie’s friends Jessie and Daisy were jumping for joy while Dosey and Topsy ,Lazy, Cheeky and Nutty were chattering, gambolling and scrambling up and down the trees shrieking with laughter they had had such fun. But now they were worn out with all the excitement and were falling asleep. 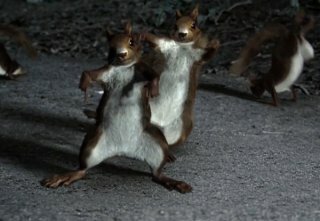 When the farmers who had been poaching began arriving back to their homes they were told about what the village wives, John and the squirrels had done to keep the foresters distracted from following them, they clapped their hands and danced merrily around each other whilst falling about laughing. “Well we have managed to get enough meat to last for many months” one of the farmers told them, “ and of course we are hoping they won’t be missed or we will be searched and punished by the King. So each of us must hide a few carcasses in or around our homes, that is after it has been skinned and salted, so let us do this now before the foresters wake up again.” So the women set to work immediately ,they plucked and skinned the venison ,partridge, swan peacock, hare and rabbit ready to be salted ,the wild boar and other meats were also salted. Once the preparation was complete everything was wrapped in cloth, the smaller animals were hidden in the farmers lofts and covered with straw to look like mattresses, hoping the foresters if they were to search took them as being the farmers and their families beds .Minstrel John along with two of the farmers went into the forest ,dug large holes and buried the venison and the wild boar. So far the plan had worked, with the help of the squirrels of course. So now people could relax for a while, that is until the foresters woke up again. The leader of the Kings foresters whom John had knocked out, was beginning to stir and so were the rest of his men .Everyone scattered as quietly as possible to their beds, pretending to be asleep waiting for what was to come from the leader if he questioned them about his men being drunk, which indeed he did. He first caught hold of John by his ear and dragged him into the village at the same time saying, “ you will get all your friends from the villages around and bring them to me men, women and children” “ but for what reason” John enquired, “ you will soon know when I question them he said”. When John had gathered everyone together he then led them to where the foresters were waiting. “ Now then! you good for nothing farmers” the main forester began “what have you been up to why were my men drunk.The village women began shouting their answer. “It was because they enjoyed our home made meads and wines which made them so merry, they wanted us to dance with them they were doing no harm good sir” “Well that’s as it may be but while they were drunk and falling asleep someone stole some of the Kings prize venison and other animals I don’t suppose you know anything about that do you?” “Oh no sir our men were either in the fields working or at home sleeping”. “Well that’s not true is it, because when I went to check the fields some of your men were missing and we are going to get to the bottom of this”. There was a slight pause where everyone was talking amongst themselves. Then the head forester continued warning the villagers that they would be punished one by one until someone informed him who were the culprits. One of the women shouted “ maybe it was Robin Hood.” “ We shall see” he replied “ You do realize that whoever stole the animals will have their hands chopped off as punishment, but first the ladies will be put in the stocks, and then perhaps they will remember something”. The villagers were instructed to put their wives ankles and wrists through the holes of moveable boards, so that waste food could be thrown at them. However no one would do this, so instead the foresters had to, after which they began throwing rotten apples and pigswill at them besides any other rotted food they could find. But the wives would not give in. The next day they were removed from the stocks, and the men-folk were taken to the Lord of the Manor to be questioned. The Lord of the Manor was beginning to get a little tired of getting nowhere with his questioning so finally told everyone to go home, but that the matter was not yet finished with and they would be searching everyone’s homes later. 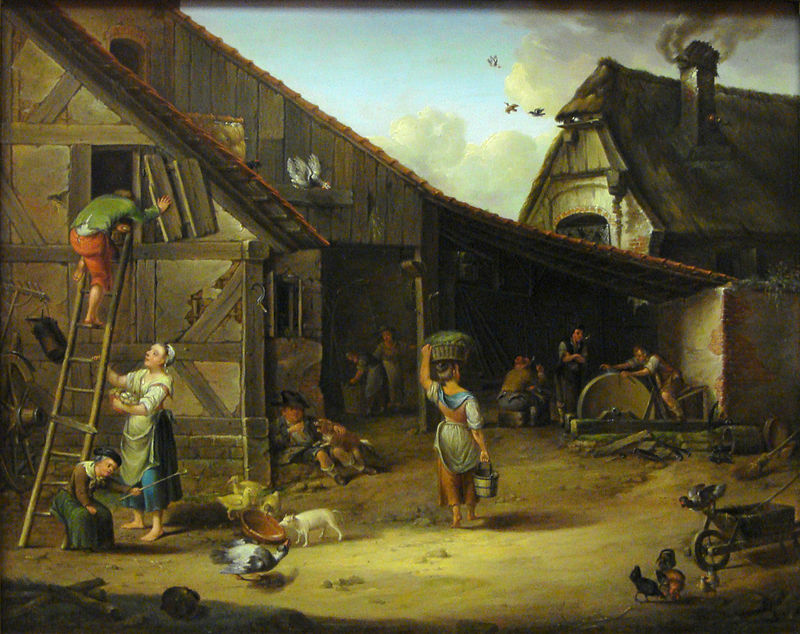 The farmers and their wives were very surprised how pleasant the new head forester was while giving his orders, and even though they were so outraged at having to give up some of their produce as there would be little left for themselves, they decided not to annoy him but keep him in a good mood and on their side. “ That’s all for now” he said, “I will be keeping an eye on things in the next few days.” Everyone began walking back to their homes chattering amongst each other wondering why the Kings animals that were missing from the forest had not been mentioned. Well maybe the new man has not been told yet but lets just hope he doesn’t hear about it anyway and we can relax. The villagers all agreed. Meanwhile squirrel Dosey overheard what they were saying and instantly called all of his friends. “ How can we find out if the King knows that some of his animals like the deer and peacock were missing?” he asked them. “ I have an idea” Jessy said “what if us squirrels go to the trees where King Richard’s animals are usually roaming about , and see what we can find out. Maybe we will come across the old Head forester” good idea come on then we’ll go now, they all replied. So off all the squirrels scampered together the usual gang in the forefront Dosey, Topsy ,Lazy, Cheeky and Nutty. “Hey wait a minute we want to come as well” Flossie, Jessy, Millie and Daisy shouted. “Oh come on then” Cheeky answered “ do we need to fetch some of the nuts we hid to throw at anyone?” asked Molly “ No I don’t think so, but if we do some of us can come back for them.” replied Cheeky. Dosey first spotted where the deer, wild boar and swans were in the Kings forest, and scampered up into the very top of the lovely oak trees followed by the rest of the squirrels. They waited and listened for anyone who might be around hoping to see the foresters, knowing that they would be talking to one another about the day’s events. The squirrels waited and waited for what seemed like ages when suddenly there was the sound of rustling leaves and whispering voices. “Wait here” Topsy said “I will go further down in the tree to see who it is and what they are whispering about” Topsy found that it was the old Head forester talking very quietly to his men and Topsy could just about hear him saying, “ Now then men ,tonight when it gets a little darker we will look for some deer and steer them nearer to the village, but we will poach them ourselves to make it look as if the village farmers have stolen them and they will get the blame followed by punishment for their bad deeds no one will suspect we have taken them.” Topsy quickly scurried back to the top of the trees to tell his friends what was about to take place. “Oh we’ll soon see about that won’t we boys” said Cheeky. “ What are you planning to do?” asked Daisy, “ I don’t know yet but give me time to think about it” he replied. much meat anyway” “ Well that just goes to show how greedy they are, they are not starving” said Cheeky. Just as the squirrels were discussing this, John appeared. “ Come on boys, lets catch up with him and ask what we can do, because we will need all the villagers to help us”. When the squirrels told him what they had overheard, John immediately called everyone together asking them to help him catch the foresters poaching. But we can’t do that when we have done the very same thing ourselves, yes but we were starving, they aren’t. I bet they are doing this on purpose just to get us into trouble because the King will believe his men rather than us. “Well we will need to catch them first then we will see” said John. “ So tonight when it is dark, we shall go quietly into the forest and hide ourselves and wait for the foresters to appear and hopefully catch them red handed. Bring any weapons you have, and some strong twine so that we can tie them up, and I will need the strongest men amongst you, we may need to take turns to watch throughout the night before they eventually appear”. So off trooped the villagers to gather their clubs, arrows and slings and any other weapons they had. They blacked their faces and put on their darkest of clothes as camouflage. Meanwhile the squirrels were also preparing themselves for some more fun. Daisy said mischievously with a twinkle in her eye “shall we black our faces with soot from the fire, “Oh you do say some stupid things” Dosey said , “why don’t you think of something sensible to help”. Poor Daisy lowered her lovely eyes and said “well I was only joking” and went off in a huff. “Alright Dosey why don’t you come up with a sensible idea” another squirrel asked. It was then that they heard the rumble of what sounded like cart wheels coming along the dusty track so they all scampered off up into the very tops of the trees and waited to see who it was. As the sound of the wheels drew nearer the squirrels were amazed to see one of the ladies from the nearby Manor House, but where was she going the squirrels wondered. They decided to follow her and discovered that she was enquiring after Minstrel John, now the villagers were inquisitive thinking whether this lady and John had been secretly courting. 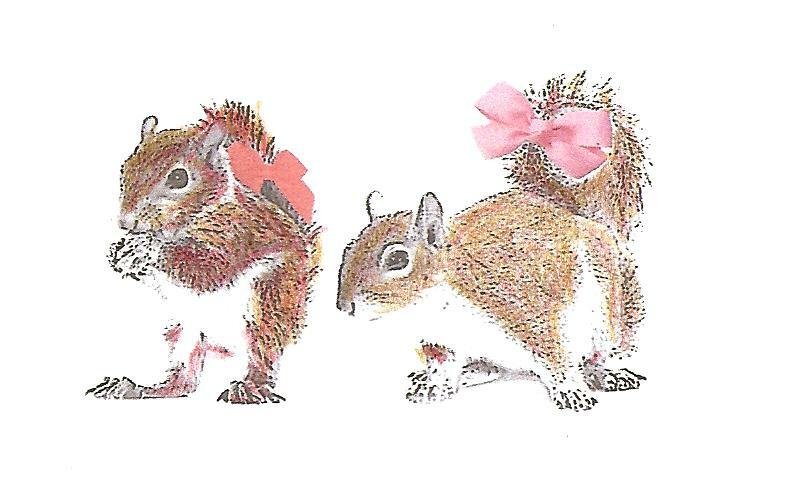 The squirrels were jumping up and down with excitement hoping this was true, if it was there was trouble afoot when her father found out, because as the cart drew near and they saw that it was Lady Beatrice and she was betrothed to another, the squirrels were getting worried and so it seemed so were the villagers. Lady Beatrice finely found John and began telling him her predicament. “ My father wants me married off to a man, Lord Finkel he is twice my age, fat as a pig and extremely ugly to boot, and of course I am in love with someone else.” “Well how can we help” asked John. “I don’t really know” Lady Beatrice replied. “Maybe you could persuade my father otherwise because Lord Finkel isn’t all that rich so I can’t see why my father wants me to marry him”. John hesitated a little while thinking, then told Lady Beatrice that first he would try to find out if Lord Finkel had any hold over her father, maybe he was threatening him. “ Whatever I discover I will let you know and then we will decide what can be done, but remember I cannot promise”. “Very well” the lady replied “ I will wait for a message from you”, and off she went. The squirrels were a little disappointed that John and the Lady Beatrice were not in fact involved with each other, but John may need their help. do, and as they did not know how long they would have to wait they took along some food and something to drink. At the same time Topsy squirrel had rounded up all his friends and they too were ready for the fun to begin. 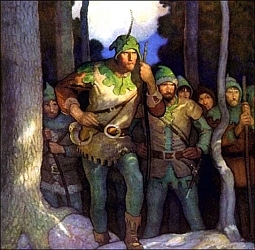 It was now midnight, John and the villagers were ready to begin their walk towards the Kings forest, they had tied sack cloth over their shoes so as not to be heard and made sure that the weapons they were carrying did not make a noise while moving. All the squirrels were very quietly trailing through the tops of the trees while trying so hard not to get too excited and make a noise in fact you could hear a pin drop everywhere was so quiet. Time was going by and there was no sign of the foresters, the villagers were very tired some were even dropping off to sleep. John then elected one of the farmers who had already had a snooze to begin the watch, saying he would be replaced on the hour by one of the others. There had not been a stir for what seemed ages when suddenly the squirrels heard voices so they threw some hazel nuts at the watchman just in case he had fallen asleep which in fact he had, and he woke with a start. “Come on boys” John whispered to the people as they tiptoed towards where the voices were coming from, but it was some distance before the foresters came into view, and they could see they were carrying huge sacks and bows and arrows ,they were also wheeling a wooden cart along, the wheels had been covered so as not to make a noise. “Shush!” said one of the foresters “I have spotted a beautiful deer, we must try and catch him before he gets away we have been successful in catching a wild boar so if we can get the deer that will do for tonight. We don’t want to poach too much in case they are missed,” “well that doesn’t matter does it we can say the local farmers stole them” said his friend. During this time John had stolen away to persuade one of the Kings Knights to follow him into the forest where everyone was waiting for him to witness the naughty foresters in the act of poaching. At that moment four of the men from the nearby village appeared and the knight enquired whether the men belonged to their local village. “Definitely not” they replied. “ Very well” said the knight “ I am going to arrest you men for poaching the Kings deer”. Whereupon the forester’s attempted to escape but the villagers were expecting this and gave chase. 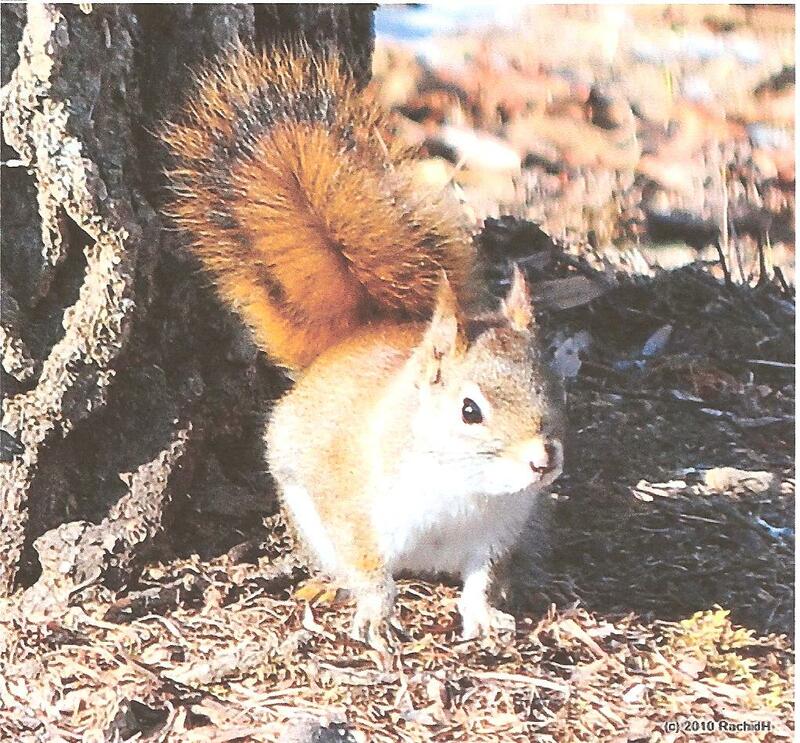 The squirrels had heard the commotion and immediately followed everyone, and while scampering along the tree tops they were able to see what was happening more clearly than the villagers on foot. “Come on you boys, and girls if you want” squirrel Topsy called “ we can run faster than the villagers so we can get ahead and try to catch those hateful men”. So once again all squirrels banded together. “ What have we got left now that we can attack them with”? Nutty asked “Now you know very well that we have plenty of ammunition stored in the holes we made in some of the trees, or were you asleep when we did that?” Cheeky asked. “ O.K. I forgot” Nutty answered. “ Are you girls coming too?” “ Ooh, yes” they replied “ we don’t want to miss all the fun.” “ Well come on then before it’s too late you girls follow us” .So off all the squirrels scampered led by Cheeky while gathering together as much ammunition that they could carry from their store. There were berries, twigs, acorns, fir cones, conkers and all sorts of seeds. Poor Flossie, as fast as she picked anything up she dropped it again and Millie was eating the nuts as she went along. Meanwhile the Kings Knight and the village folk were still chasing after the two men who had killed the Kings deer and were now nearing the edge of the forest. The squirrels had reached the edge of the forest and were now well in front of the two poachers, and were hidden in the tops of the trees waiting. “Here they come,” whispered Topsy, “ get ready”. When the men were near enough the squirrels began to attack them unmercifully while Flossie, Jessy, Millie and Daisy had jumped to the floor and were digging their sharp teeth into the foresters ankles. Dosey, Topsy, Lazy, Cheeky and Nutty had landed on the men’s shoulders and were clawing them with their sharp claws and biting their ears while the rest of the squirrels threw the acorns and fir cones at them. Milly had got some red berries and she decided to rub them all over the forester’s faces. There was such a commotion between the squirrels and the villagers who were now on the scene and shouting for the Kings Knight to approach them. The squirrels danced, chirped and gambolled around they were having so much fun. At last the two men gave in, they were covered with bites and scratches and the juice from the berries was running all down their faces. 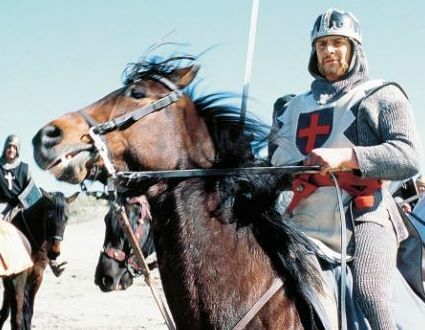 The villagers were tying their wrists and ankles when the knight appeared and dismounted from his horse and approached the two men who by now were exhausted and looking very sorry for themselves. “You two men will come with me so that King Richard can deliver your punishment. Strap them in that cart and every one follow me”. said the Knight. “ Does that mean we can go as well” asked Daisy, “I don’t think that we would be allowed to enter the castle but we could go so far answered” Cheeky. Some of the local women had stayed behind to tend to the badly wounded deer and had removed the arrow from his thigh, they were gently bathing the wound while making the animal comfortable, then later returned to their homes but leaving two of their friends to watch over the deer during the night. They awoke next morning to find a beautiful Doe gazing down upon her mate with such sad eyes. The two women remained very still so as not to frighten her away while watching to see what she would do. The doe then began to nudge her mate while attempting to lick his wound clean which is most animal’s instinct. 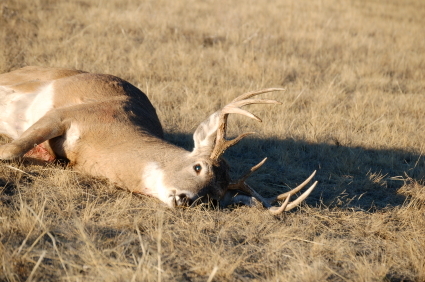 She then slowly settled down beside the deer. The women gradually crept silently away without disturbing the two animals who looked so happy together. “I therefore commit you to the dungeons until I decide to release you, and think yourselves lucky you have been spared the gallows but if my deer dies you will most certainly hang”. King Richard then ordered them to be taken to the dungeons. As the villagers were about to leave the knight gave them a signal to wait a moment and addressed King Richard saying, “ Your Majesty these good people were responsible for the capture of those men, and some are at this very moment attempting to save the life of your wounded deer. I think that if your Majesty sees fit they deserve a small reward”. “ I most certainly do” the King replied. “So what reward would you suggest Sir Knight?” he enquired. to your homes”. Everyone slowly walked away muttering to one another and looking disappointed, convinced that they would never see any reward, they finely returned to their homes. Sometime later some of the farmers wives decided to check if the deer was recovering from his wound, and as they quietly came to the spot where they had left him and his mate they could see he was standing fully recovered, and even though he had seen them he made no attempt to run away, so they very gently moved further towards him and he to them. The deer then began to nudge each of the women as if to thank them for their help. At that moment the doe came towards her mate followed by two beautiful young fawns, it was such a lovely sight to see that the women were in tears of joy. King Richard had heard that his deer was alive and well, and had decided on the reward for the village folk. 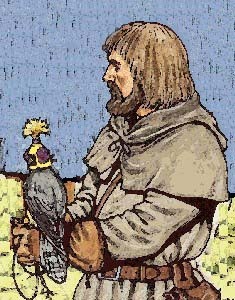 He sent for his Knight who enquired if the King had come to the decision of a reward for everyone. “I have indeed” the King said “ I have come to the decision that as a reward for all the people who captured those poachers they would appreciate some food supplies, as most of them look very thin and weary. In fact, I would go as far as to say half starved, so give them as much of everything they need to last them throughout the winter”. “Very well your Majesty I will attend to that immediately. It was sometime after the villagers had returned home from their work there was a noise sounding like horse’s hooves and the clatter of cartwheels approaching the village. Everyone ran out from their homes to see what was going on. There was indeed not one cart but many, and there were four knights riding beside them who swiftly dismounted once they reached the village. “Who is the main spokesman for your village” one of the knights asked, the village blacksmith stepped forward saying “I am Sir Knight”. “Very well” he replied, “we have brought King Richard’s reward for you for capturing the two villains, and we are here to help you unload and store your reward”. 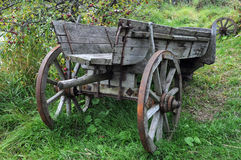 Everyone wondered what was in the carts as they were covered and when they asked, the Knight’s told them to gather around and they would soon see. Slowly everyone walked around as the four knights began to uncover the carts which were laden to the very top with all manner of foods and drinks. The villagers were astounded, their eyes wide open with excitement, they began to cheer and dance around each other and the squirrels had clambered down from the trees skipping, cheeping and jumping over each other along with them. Once everyone had settled down it was time to unload the carts, and hopefully find storeroom. There was so much they had to find room for that they did not know where to begin. There was meat such as venison, wild boar, beef, pork, veal, lamb and goat. There was duck, grouse, goose, swans, herons, peacock and dozens of hams, black puddings also trout and salmon and large variety of vegetables and bread. Added to this was plenty of ale, mead and cider with which to swill down the food, and plenty of fruit. The Knights joined in with the excitement while helping the villagers to unload. the carts, off scampered the squirrels, and to their relief the sacks were still there but so dirty and damp. The squirrels gathered around and began to collect the sacks together carrying a few each the best way they could between their teeth or in their claws. They had to go back several times to collect more and the villagers were amazed at the squirrel’s organization and set to work washing the dirty sacks and hanging them to dry. Poor Lady Beatrice was beside herself waiting to hear from John, whether he knew if Lord Finkel was blackmailing her father, and if so, for what reason. It seems her father was in debt to the sum of a large amount of money, and could not pay it back. Lord Finkel had heard about this, and was also demanding money, and threatening to tell everyone which would shame both Lady Beatrice, and her father who had agreed her hand in marriage to keep the wretched man quiet. “Well we could ask Robin Hood to help,” one of the villagers said. “In what way?” asked John. “We could ask him and his men to take money from the rich, and then what he collected we could give to Lady Beatrice’s father to help with the money he owes.” “Yes but her father is not a poor man and Robin Hood only gives money he has gained from the rich to the poor” John replied, “ besides it is a long way from Sherwood Forest to here, but it’s a thought, we could ask Robin and see what he says. I will ride to Sherwood immediately and talk with him”. 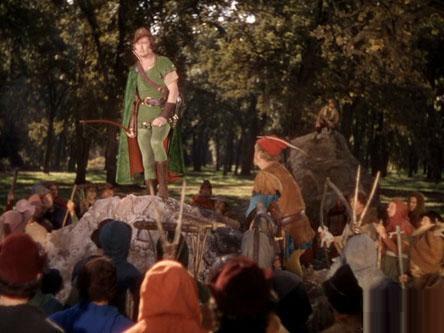 When John arrived at Sherwood Forest he was greeted by Robin Hood’s band of men, and then led to meet Robin himself. “What may I do for you my good man” asked Robin. After telling Robin why he needed his help, John also explained that it was he himself whom the lovely Lady Beatrice really wanted to marry, but until now no one knew, they had kept it a secret from everyone. 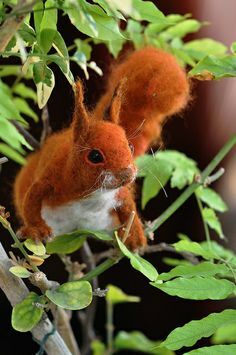 Of course a few of the squirrels had followed John to Sherwood, and overheard everything, they were so pleased because they had suspected it all along. The squirrels were really excited as this meant if Robin Hood could help her father, then he would have to agree to his daughter marrying John, and there would be a big celebration which the squirrels no doubt would invite themselves to. “Well !” said Robin, “ I do believe that Lord Finkel himself will be riding this way sometime tomorrow, and maybe he will have some of the money he has taken from Lady Beatrice’s father, so my men and I will surprise him, how does that sound?. In the meantime John you must stay with us and we will make merry this evening shall we?” “Splendid” said John. After so much merriment that evening Robin and John awoke bleary eyed, late in the morning, in fact it was almost midday, but fortunately Robin Hoods men were keeping a watch out in case the dreaded Lord Finkel passed their way, up until now all was quiet. It was not long before the sound of horse’s hooves could be heard. Robin’s men quickly hid themselves among the trees and waited until they could see who was approaching. Finally when they could see it was indeed Lord Finkel, and that he was near enough, Robin and his men pounced on him. Lord Finkel was so startled that his arms went up in the air, and he fell from his horse, which caused all the money he was carrying to scatter to the floor. Robin’s men caught and held him down, whilst Robin himself informed him that the money his men were gathering together he was keeping. “But what for, it’s my money,” Lord Finkel replied. “ I don’t think so” said Robin “ you have stolen it from Lady Beatrice’s father.” “Oh! No, no, no. Who are you anyway who do you think you are, taking my money from me, I will have you arrested.” “ I think you know very well who I am” said Robin “ my men and I are going to ride back to your home with you, to get the rest of the money you have previously stolen through your blackmailing” “ I don’t know what you are talking about” “ Oh yes you do we have a witness who overheard you, so you cannot get out of it.” Upon that Robin’s men fastened Lord Finkel’s hands behind his back, and lifted him back onto his horse. Once all the money was retrieved from Lord Finkel, both John and Robin made their way to see Lady Beatrice to tell her the whole story of why her father was being blackmailed. She was alarmed at this news, but pleased in another way, because this she hoped, would surely mean her father would release her from having to marry the fat ugly Lord Finkel. She knew that her father liked the Minstrel John, so hoped he would agree to her marrying him instead. When Lady Beatrice explained everything to her father he was so relieved he caught hold of his daughter whilst laughing heartily, and danced and danced around her and thanked John and Robin for their help, promising to pay all his debts with the money they had got back from the horrid Lord Finkel. “There is one favour we would ask in return.” “Yes oh yes! Of course, anything, tell me what can I do?” Lady Beatrice’s father replied. “That you relinquish your wish that your daughter marries Lord Finkel.” “0f course I will, I never liked the dreadful man anyway”. “There is more” said Robin, “and that is will you now give your permission for your dear daughter to marry this good man standing beside me, the minstrel John.” “Well! I think I must, although it is not usual for a Lady to marry a commoner, but I have seen how unhappy my daughter has been, and I can now see why, so of course I will agree.” Everyone cheered and clapped, including Robin’s men who had been listening while waiting outside for Robin. Lord Finkel was seething with jealousy at losing Lady Beatrice, and now he had to face his punishment. 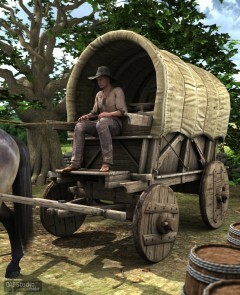 John bid Robin and his band of men farewell, and began his long journey back to the village and his friends. He left Lord Finkel with Robin, to face the punishment they had planned for him. When John reached home the villagers were waiting to greet him, and were anxious to hear all his news, but they could see he was very tired and told him to rest first. 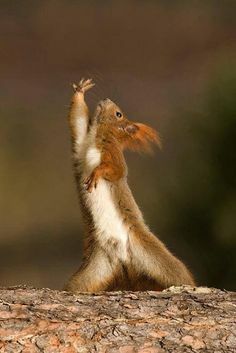 “I will see you all tomorrow and I have something special to tell you.” All the squirrels had heard that John was home and were waiting very early next morning, they also wanted to hear all of his news. Time was getting on and there was no sign of John, everyone was getting a little impatient. “I think he must have overslept” the village blacksmith said, “ maybe someone should wake him,” but just at that moment John appeared and apologized for keeping them waiting. “ I must quickly tell you of my meetings with Robin Hood, so that you can get on with your work, we don’t want the Baron Beauly complaining you are neglecting it or you will be in more trouble”. Before he could go any further they wanted to know where Lord Finkel was. “ I have left him with Robin and his men, they will certainly make sure he is well and truly punished for his crime”. When the squirrels heard this they were a little disappointed. “ Oh bother” said Daisy, “ that means we won’t have the fun of chasing and teasing him, I was looking forward to throwing things at him like we did those naughty foresters”. “That was great fun wasn’t it?” said squirrel Jessy “Yes I agree, but let’s listen to John now” said Dosy. John then continued explaining to everyone how they had caught Lord Finkel which made them burst into fits of laughter. “Now calm down, I have some very good news to tell you” Pausing a while, he was thinking how best to explain his forthcoming marriage. “Come on then don’t keep us in suspense,” “yes come on” they all shouted. “I am to be betrothed” he said very quickly .Hurrah! 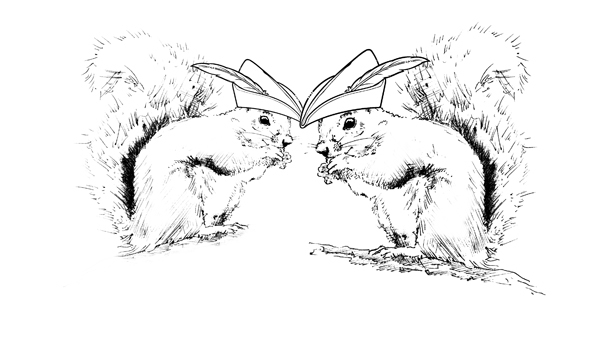 The villagers chanted, whilst hugging each other in excitement, and the squirrels were also doing their usual acrobats in the trees, then all went quiet. “Just a minute John, you haven’t said who is to be your bride, we haven’t seen you with anyone”. “No that’s true, no one knew but I can now tell you that Lady Beatrice is to be my betrothed”. Upon that everyone cheered. The squirrel Cheeky was chuffed with himself as he had guessed right all along. “So now you must carry on with your work for today” John told them, “and we will make plans for my marriage later”. “Ooh! that’s going to be exciting” Millie remarked, Jessie and Flossie agreed. Lady Beatrice was so happy her father had agreed to her marrying John, that she immediately began looking at the most exotic materials from which her wedding gown would be made, and called upon her lady in waiting Rosanne to help her. “Oh! I am so pleased for you my lady” Rosanne exclaimed. “Now what colour, and what material would you like your wedding gown to be? There are beautiful shades of blue, red, green or purple, and you could choose silk, satin or damask for the material”. “I think I would like a rich peacock blue for the colour, and my gown to be made from the finest silk, and woven with gold and silver thread.” “That sounds wonderful my lady, and would you like some precious gems sewn into your dress” Rosanne asked. “Oh yes that will be splendid but which shall I choose”? “Well you have a choice of rubies, sapphires, emeralds or diamonds”. “I think diamonds because they sparkle, and maybe some emeralds”. “Very well my Lady I will attend to that at once”. Meanwhile the villagers were trying to help John with his wedding plans. “Oh dear I can’t make up my mind what colours to wear for my marriage to Lady Beatrice” he told them. “Well you have plenty of choice” they told him. “I know but don’t forget I am just a commoner, and not used to wearing such fine clothes”. “But you are loved by everyone, even the King”. “Don’t forget the squirrels in the forest love you as well” whispered Topsy “ so you must choose the finest clothes for this occasion”. Very well, I will take your advice and first think about the colour”. On the way back home John stopped at the village blacksmiths, and asked what he thought about a rich green colour to wear on his wedding day. “That sounds befitting to me young man, and if you don’t mind me saying so your coat should be made with silk and trimmed with fur”. John thanked the blacksmith and returned home. The wedding day finally arrived, and everyone from the villages around had gathered together to witness the Minstrel John and his lovely bride being married, including all the squirrels from the forest, also unbeknown to Lady Beatrice, John had asked Robin hood and his band of men to attend the great day, and they were already there hiding among the trees where they could not be seen. When at last the bride and groom appeared there were gasps of admiration from everyone. Lady Beatrice looks so exquisite the people murmured, and just look at John I hardly recognize him, he looks so dashing in those richly coloured silks all trimmed with fur. The squirrels Daisy, Millie and Flossie were just swooning, and rubbing and rolling their eyes “Oh ooh, Lady Beatrice looks so pretty in her beautiful wedding gown” they said “and look at the train of her dress flowing way behind her and those sparkling gems, they seem to make her eyes sparkle as well and they look so happy together”. Once the priest had pronounced Lady Beatrice and John as man and wife the merriment began. Robin Hood and his men appeared from where they had been hiding, the squirrels leapt from tree to tree with excitement, and the villagers cheered and danced around John and his beautiful bride, and around each other, all were caught up in the celebrations. Everyone was pleased that Robin Hood and his men were able to come to the wedding, but they had to leave early as they did not wish to be caught by anyone and handed over to the Sheriff, after all they were well known outlaws. 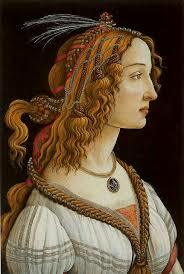 But they were happy they were able to help Lady Beatrice to fulfill her dream of marriage to John. The celebrations continued throughout the day and into the evening, with the squirrels continually gliding and gambolling through the trees and having a whale of a time, they were dancing and chirping while generally showing off their skills. They had skipped onto the tables and helped themselves to the food which included some nuts, they also dipped into glasses while no one was looking, and sipped the wine until they were so full up and tipsy that they were falling all over each other. The villagers were also enjoying themselves and were very merry. John and his bride had slipped quietly away for some time to themselves. It was time the following day for the men folk to return to working the land, the womenfolk stayed behind to tidy up from the previous days wedding. Everywhere was peaceful and the villagers were content in the knowledge that everyone was happy, especially the Minstrel John and Lady Beatrice. The poachers had been caught and punished. Lord Finkel had been left with Robin and his men to be punished for his crimes, the Kings deer which had been badly wounded had fully recovered, and some of the villagers who had grown fond of him made sure he was alright. The squirrels however were happy in one way, but sad in another, because there was no more excitement to look forward to. “It is going to be really boring now” Cheeky said to Lazy. “Oh well it doesn’t matter to me I can have a long sleep now” Daisy replied. “I think we will all have a sleep shall we” said Milly “good idea” they all agreed. 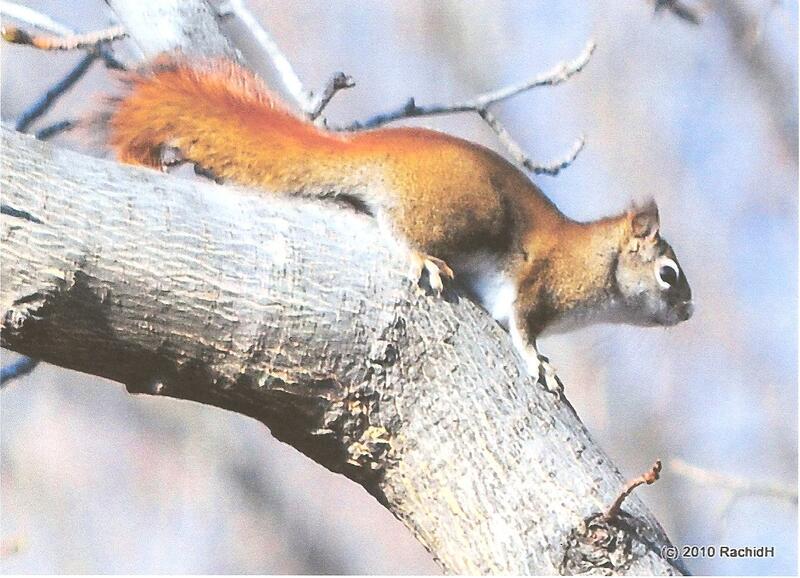 I would like to thank Rachid H for his kind permission in allowing me to use his Squirrel Photograghs. 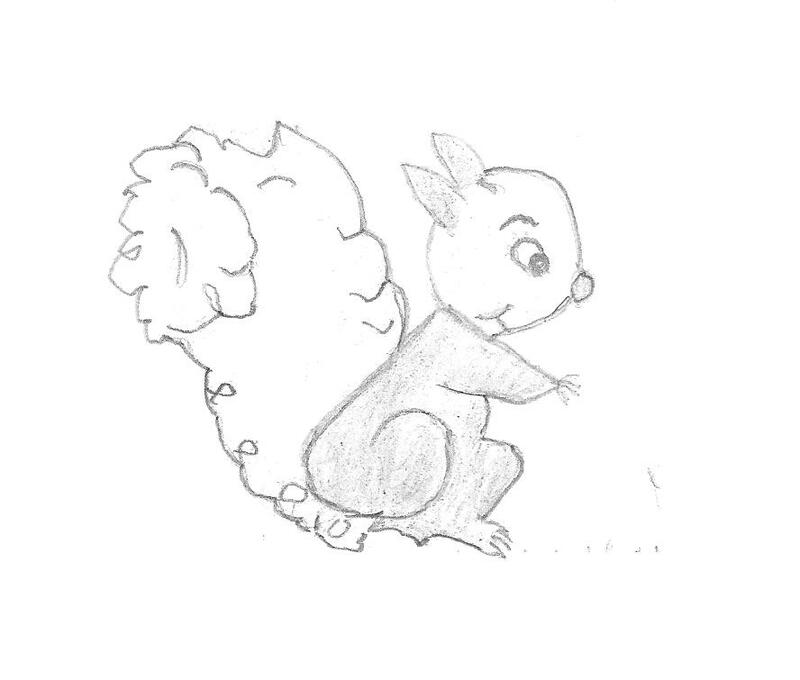 Also my Grand daughter Eve Roberts age eleven for her lovely sketches of squirrels. 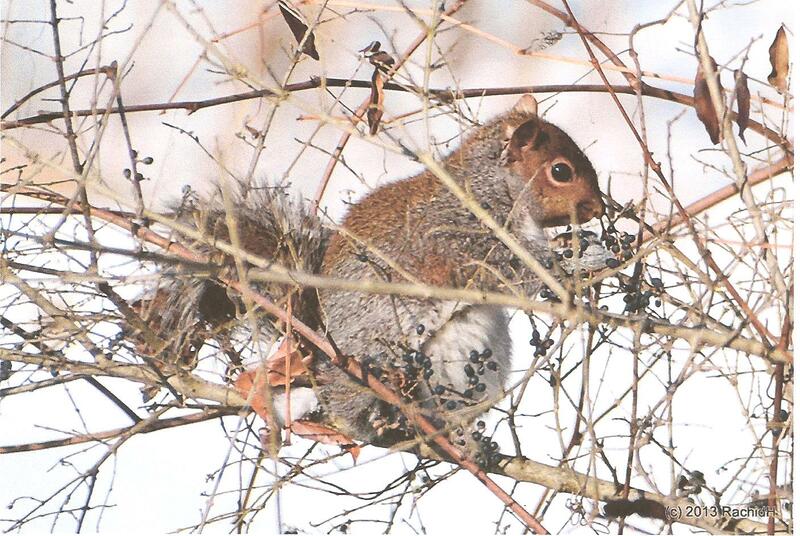 All written content in ” The Minstrel John and the Squirrels” is copyright © to Rita Roberts . All rights reserved Date March 1st 2011. Awesome,beyond words or imagination. Sending it to my grand children to be fascinated too. Thanks for your nice comments Rachid. I hope your grand children enjoy my story also. Its a long story to read online Eunice so how much did you manage. Maybe you can come back from time to time and read a little at a time .When you have time of course.